Not only can back pain interfere with your daily activities, but can also be difficult to diagnose and treat. There is a wide range of possible causes and contributing factors for your back pain. There are many types of back injuries; however, the most common types of back injuries include herniated discs, spinal compression, strains and sprains and vertebral fractures. A muscle strain is a back injury that commonly occurs while doing physical activity. Muscles can become strained when there is excessive pressure place on it or if the muscle moves in an unnatural way (such as suddenly turning your body). A muscle strain occurs in your back when the small fibers (tendons) begin to tear, which leads to pain and discomfort. This type of injury is known as a muscle rupture. A muscle sprain is similar to muscle strains, except a sprain occurs in the ligaments that attach the bones within your joints. Another common type of back injury is a herniated disc. 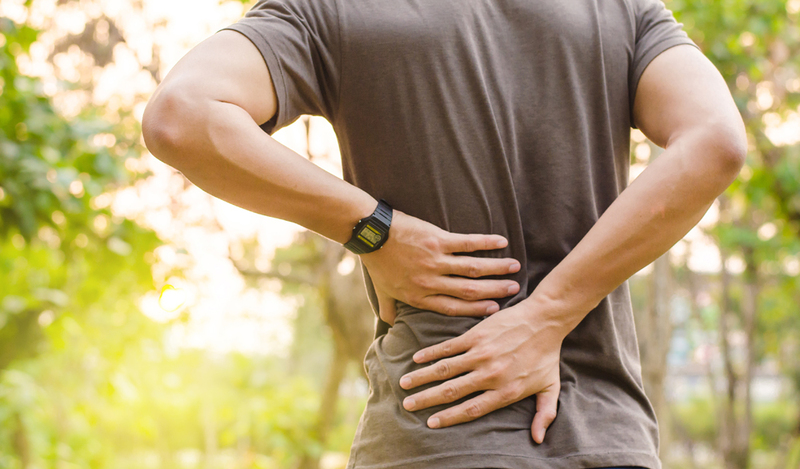 This type of injury may or may not cause you significant pain and some people never have any symptoms of this type of back injury, but others may develop severe pain. Between the vertebrae in your spine are spinal discs; if the disc becomes compressed, the vertebrae may put undue pressure on the disc (herniated disc), which causes pain in your back, neck and hips. The injured disc can affect not only the spine but other parts of the body. A fracture occurs when a bone is forced to endure excess force, which results in small cracks in the bone known as fractures. In some situations, a fracture can be very small and heal on its own; however, some fractures are extensive and may require medical attention. A vertebral fracture can be an extremely serious injury, so it is essential that you see medical attention if you suspect a back injury. For example, if you were injured in an automobile accident, received injures while playing sports or if you fell onto your back on a hard surface. Spinal compression occurs when your spine presses against itself. This may be the result of sudden force applied to your spine, an injury or it may happen simply because of the pull of gravity on your body throughout the day (poor posture). Spinal compression can result in extreme discomfort and may lead to the development of herniated discs and/or muscle strains. The good news is, in most situations your Atlanta chiropractor can help relieve the pain and discomfort associated with a back injury. Chiropractic care for a back injury is holistic, often reducing the need for painful surgery. Chiropractic treatment for a back injury may include massage therapy, spinal manipulations and exercise. Contact Century Center Chiropractic today at (404) 634-1669.